eyeMath is another educational math iPad application that I really like a lot. 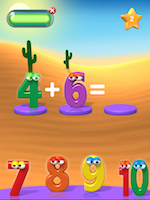 Unlike many of the other math iPad apps I have reviewed, eyeMath has a high tech feel to it – great resolution, strong music… just good eye candy for kids. The idea is simple as the image here suggests. It is multiple choice and players have three minutes to solve the problems. eyeMath gets progressively harder as you move through the game. eyeMath also has a feature that I absolutely love, a simple thing yet few other math games have it: problems answered incorrectly reappear later until the student gets the answer correct. It is a little thing but if your child has a nagging equation they just can’t get, it might be a while before they see it again in most games. eyeMath allows you to attack this weakness head on. This is a behind the scenes video on the creation of the graphics on Apple iPad application by Henk Dawson. All very cool. My favorite iPad apps to review are games with a free version so you don’t have to take my word for it. eyeMath has a free version.